"Baralgin" is a combined analgesic and antispasmodic agent. Active substances of the drug are fenpiverinia bromide, Metamizole sodium, pitofenone hydrochloride. 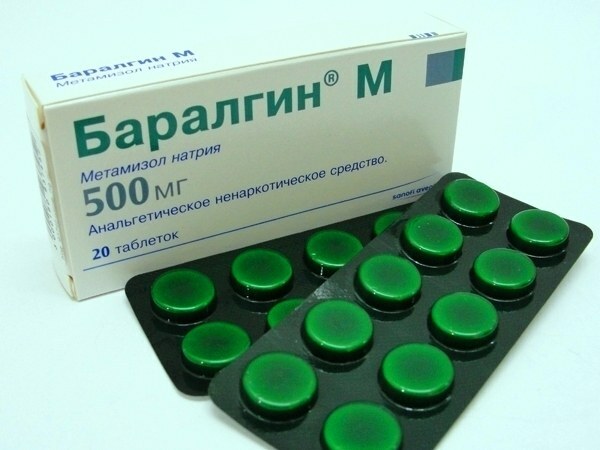 "Baralgin" is prescribed for relief of mild and moderate pain syndrome, caused by spasms of smooth muscle in renal, intestinal, biliary colic, spasm of the ureter, bladder. The drug is also used for biliary dyskinesia, postcholecystectomical syndrome, chronic colitis, diseases of the pelvic organs, algodismenoree. "Baralgin" used for short-term treatment of sciatica, myalgia, neuralgia, arthralgia, and as an aid to eliminate the pain syndrome after surgical interventions and diagnostic procedures. The drug is available in tablet form, suppository, solution for injection. Pills "Baralgin" prescribed to adults and children from fifteen years to one or two pieces two or three times a day. For children twelve to fourteen years a single number is one pill, the maximum is 1.5 tablets four times a day. Children eight to eleven years of age give ½ tablet (maximum 4 tablets daily), for children from five to seven years one time amount is ½ tablets and a maximum of 2 tablets per day. Adults and children over 15 years in acute colic slowly intravenously injecting two milliliters of the drug, if necessary, after six to eight hours doing re-injection. Intramuscular "Baralgin" administered for two to five milliliters two to three times a day, the daily amount should not be more than ten milliliters. Duration of the drug is five days. Children weighing 5 to 8 kg "Baralgin" is administered only intramuscularly in an amount of 0.1-0.2 ml, with a weight of 9-15 kilograms of the drug is administered intravenously at a dose of 0.1-0.2 ml intramuscularly - 0,2-0,3 ml, weight 16-23 kg intravenous - 0.2-0.3 ml, intramuscularly - 0,3-0,4 ml. in children with a weight of 24-30 pounds, the dose for intravenous injection is 0.3-0.4 ml for intramuscular injection of 0.4 – 0.5 ml, children weighing 31 to 45 pounds should intravenously inject 0.5-0.6 ml, but intramuscularly – 0,6-0,7 ml. of Children 12 to 15 years intravenously, intramuscularly injected with 0.8-1 milliliter of solution. Prior to injection of the drug vial to be heated to do this, it should be a little hold in the hand. "Baralgin" can cause allergic reactions, disorders of the kidneys, anuria, oliguria, interstitial nephritis, proteinuria, increased sweating, lower blood pressure, agranulocytosis, leukopenia, thrombocytopenia, dry mouth, tachycardia, difficulty urinating. The drug is contraindicated in cases of hypersensitivity to it, renal and hepatic insufficiency, with tachyarrhythmias, severe angina, intestinal obstruction, angle-closure glacoma, decompensated chronic heart failure, prostatic hyperplasia. The tool is not used in the collapse, megacolon, pregnancy, lactation, children up to three months and the baby weight less than 5 kg of Tablet "Baralgin" contraindicated in children up to five years. With caution the drug is prescribed in bronchial asthma, aspirinbuy triad, hepatic, renal failure.